This wildland fire workshop was designed to enable land managers, researchers, resource specialists, biologists, ecologists and fire practitioners an opportunity to hear and learn from different areas of expertise in a format designed to identify gaps in knowledge and communication, and work toward solutions to issues that complicate our collective wildland fire work. Over the two days we explored four topic areas that are relevant across the State of Michigan and the Upper Midwest, and had interactive opportunities including panel discussions and breakout sessions. Applying Fire to Degraded Habitats and Declining Species in the 21st Century: Pyromaniacs or Ecological Saviors? What is the "the perfect burn?” Interpretations of what makes a burn “perfect” varies dependent on objectives, agency/organizations, specialist views, level of fire science/fire implementation knowledge and experience, etc. However, in describing what we desire for the end result of a burn (do the fire effects meet the objectives and goals) we have the opportunity to talk about what we're looking for and what we hope to achieve, and separate out personal assumptions and expectations versus feasible effects. 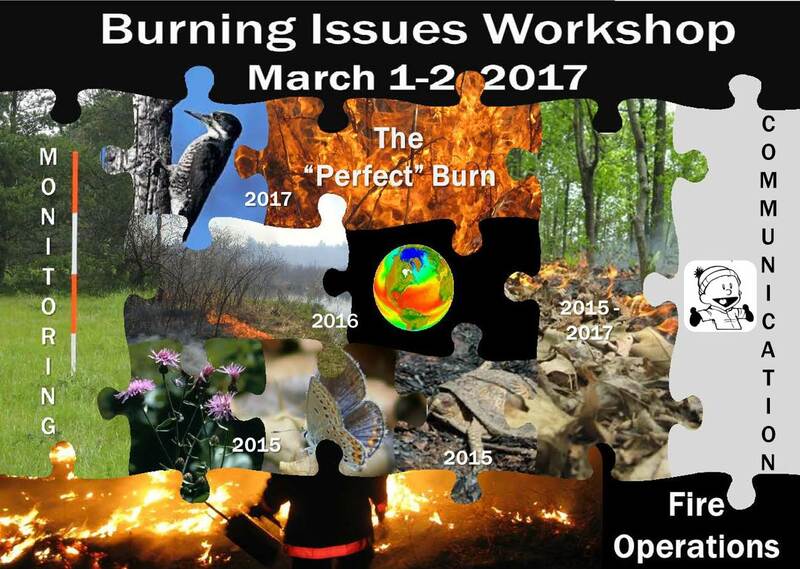 Enhancing the Landscape with the "Perfect Prescribed Burn"
In this session we will discuss how a monitoring program needs to be designed to meet specific needs, and how a monitoring program adapts over time to inform management decisions. We frame the development of a monitoring program by addressing these questions: What did you need to know? How did you do it? How well did it work? This session sets out to answer a couple of big questions about oak-dominated ecosystems: 1) What is mesophication, and why has lack of fire made it difficult to regenerate oak today? 2) What does reintroducing fire help us do in oak-dominated ecosystems? and 3) How do we combine fire and other tools to meet management objectives? Speakers in this session have been addressing these questions in oak woodlands and forests across the eastern United States. The oak regeneration problem in the Midwest….and the implications for oak ecosystem restoration. Thinning and Burning in Oak Forests: A Tale of Two Sites. Building capacity to use prescribed fire for wildlife conservation and resilient landscapes. The goals of prescribed fire or fuel reduction treatments may be to improve wildlife habitat, but fire management objectives and prescriptions are rarely defined by wildlife needs. This session will emphasize connecting fire management to wildlife needs. The research and case study are from northern lake states ecosystems, with general principles that can be applied to fire-dependent ecosystems south of the tension zone, as well. Prescribed Fires role in Elk Management in Michigan. Travel in conjunction with educational activities to become proficient or qualified in one or more areas of responsibility. 5 USC 4101(4) states that “‘training’ means the process of providing for and making available to an employee, and placing or enrolling the employee in a planned, prepared, and coordinated program, course, curriculum, subject, system, or routine of instruction or education, in scientific, professional, technical, mechanical, trade, clerical, fiscal, administrative, or other fields which will improve individual and organizational performance and assist in achieving the agency’s mission and performance goals.” - and - b) More than half of the time is scheduled for a planned, organized exchange of information between presenters and audience which meets the definition of training in section 4101 of title 5, United States Code.